Hi, everyone. 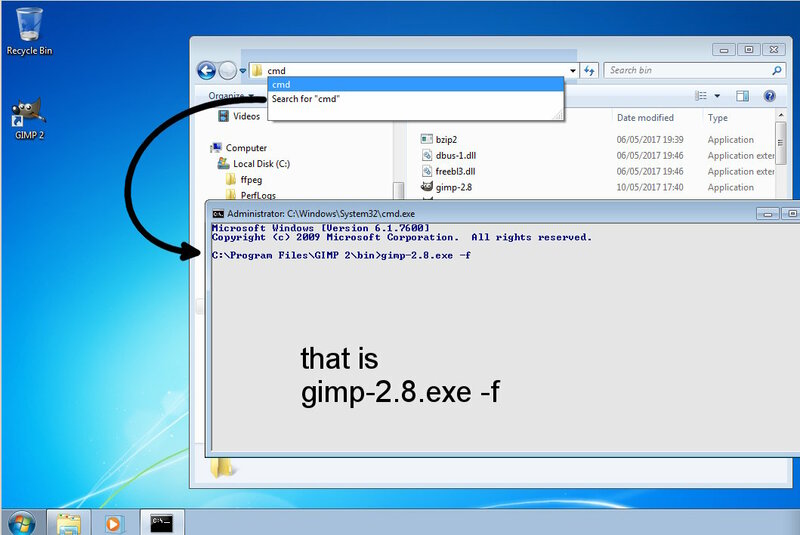 I've used GIMP for a long time, and just recently I installed a new OS (Windows 7) on my computer. On my previous OS I had a collection of google fonts that I downloaded (they were numerous), but I never had a problem with startup loading taking so long. I re-installed the fonts and now GIMP takes about 5-7 minutes to startup. I thought there was a cache that made the loading quicker, but the speed has not increased at all. Is there anything I can do except deleting the fonts? I need them in GIMP. Yes, normally there is a cache, so even though the first execution can take a while, subsequent executions are much quicker. Are the fonts installed only for Gimp or are they system fonts? Are you positive it's the fonts? Other add-ons can cause startup delays especially if they make Gimp use a lot of memory (brushes and patterns, in particular). If all else fails (and in any case if you use a lot of add-ons) my addon manager plugin lets you easily activate/deactivate groups of add-ons so that Gimp only sees a reasonable number of these. I had a long reply prepared but on reflection, over the top. First thing to do is test start Gimp with no fonts and check that it starts quicker. In the search bar type cmd and enter key to open a terminal. (06-21-2017, 06:38 AM)rich2005 Wrote: I had a long reply prepared but on reflection, over the top. One thing to check is whether the font cache has been created (somewhere in the user's AppData IIRC). (06-21-2017, 08:11 AM)Ofnuts Wrote: thing to check is whether the font cache has been created (somewhere in the user's AppData IIRC). What advice? Delete it? Gimp will make another, presumably other applications will if required. Should be safe enough. I do wish MS Win would not make it so easy to install fonts system wide. Some statistics for comparison. This is that Win7 64 bit VM with a very modest 2 GB memory allocation. Using the -f switch for no fonts. Not much difference 4 to 8 seconds. First run, Gimp 30 seconds - presumably creating the cache file. Second run, Gimp down to about 15 seconds. So if you get times much greater than that, probably a broken font. The font cache now looks like this. Delete that last entry? but with a broken font AFAIK you still have the problem. Looks like deleting the excess fonts is the option. The OP can check if the cache is created on the machine. From memory, the fonts as seen in Gimp are handled by the GTK support. On Windows, it can cherry-pick the system fonts but this is a GTK config, not a Windows config. (06-20-2017, 10:45 PM)Ofnuts Wrote: Yes, normally there is a cache, so even though the first execution can take a while, subsequent executions are much quicker. Yes, they are system fonts. The loading status bar at the bottom of GIMP says "Fonts - This may take a long time". I have no addons installed or brushes yet. That only proves that there is a problem with one or more (or too many) fonts. You can draw but not add any text. If you need to use fonts you will need to determine which ones are causing the bottleneck. Not so easy in Windows which installs in the blink of an eye, but does not always remove cleanly. @Wortel, You have Linux as your OS, which version of linux and which version of Gimp? Linux fonts should not be any problem, however those installed in root rather than your home directory (or partition) can be disabled with a font manager. 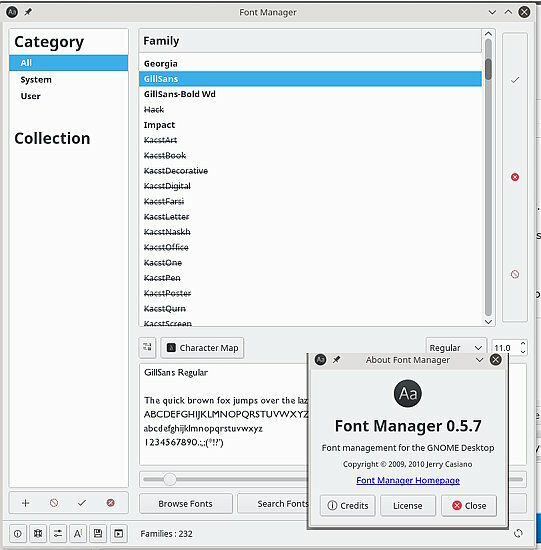 While I use KDE the gnome font manager does the job. https://i.imgur.com/EmCIVa8.jpg lots disabled there. Otherwise any fonts you add should go in ~/.fonts for use in all applications or ~/.gimp-2.8/fonts for use with Gimp. Lots of fonts for Gimp - Use Ofnuts resources manager. (10-13-2017, 09:22 AM)rich2005 Wrote: While I use KDE the gnome font manager does the job. https://i.imgur.com/EmCIVa8.jpg lots disabled there. Which package is that Gnome font manager? The KDE one usually dies when I ask it to disable a font.